Stand-up comedy walks in the streets of Amsterdam. No more boredom and yawning during city tours in Amsterdam. Instead, a 1,5 hour stroll filled with laughter as a super hilarious stand-up comedian guides you through the most characteristic places in Amsterdam. Next, Laura suggested to Erik, who is a comedian himself, that it would be a lot more fun to have a stand-up comedian guide a group as traditional city walks can be so boring. So this is how the idea of Comedy Walks made it into the world. A Comedy Walk is a city tour with a professional stand-up comedian as a guide or a stand-up comedy show with the city as a stage. The Comey Walk starts at the Spui and takes you in 1,5 hours to the Nieuwmarkt; both in the city centre. This concept is not only great for tourists, both national and international, but even people born and raised in Amsterdam enjoy these walks seeing their heritage from a totally different perspective. Each comedian has it’s own style, content and route whereby unique historic buildings in Amsterdam become the connection between the comedy and the city. You could look at it as an evening at a comedy club like ‘Boom Chicago’ or ‘Comedy Cafe’ except that your comedian is walking along the stage and you better follow him or you will miss out on the best jokes. You will learn about some particularities of Amsterdam, but in a super fun way. 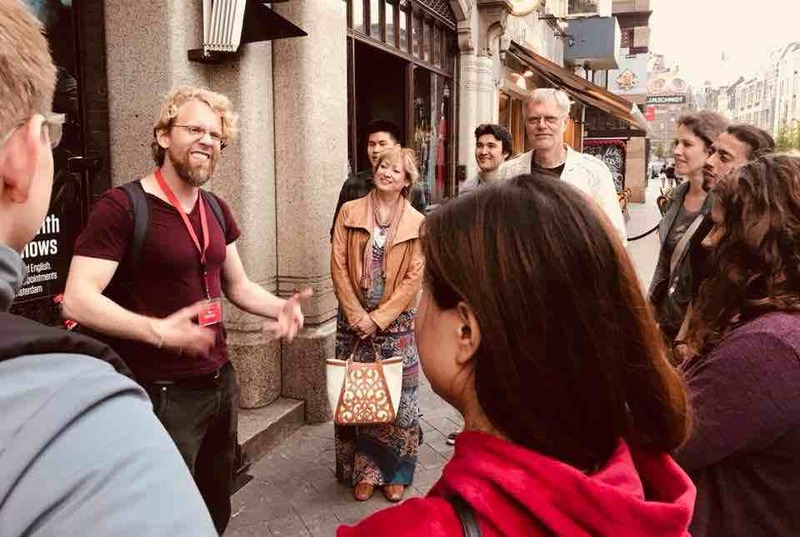 According to Erik, several locals from Amsterdam told him they are very enthusiastic about this new concept and would love to come on another Comedy Walk. 2019 there will be an additional Comedy Walk on Sundays at 15.00.
through the streets of Amsterdam.